If you are a school, preschool, daycare center or a similar institution, you can order our book at a discounted rates. Click HERE to to go to Mr. Specht’s speaking engagement page to learn more. Find out more about how teachers use our book in class! Our school would like to purchase 35 books – A Little Rees Spect Cultivates Kindness. Would it be possible for you to send me a quote and a sole source letter. 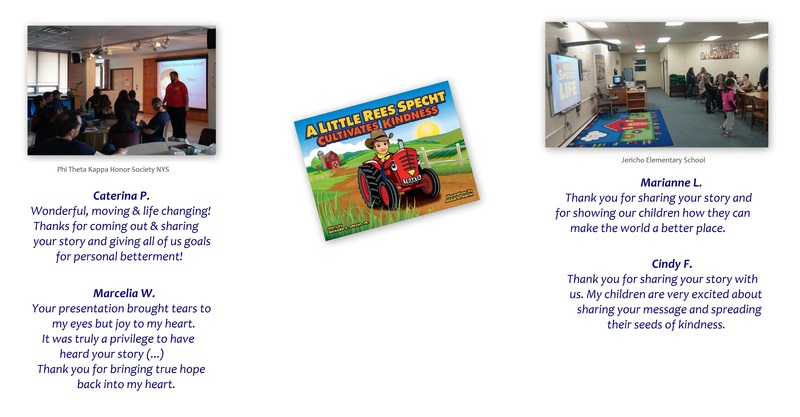 I would like to inquire about purchasing Rees’ book or books to put in my daughter’s elementary school library. I would love to be quoted a price on 5 books. I would also like a quoted price on 160 books. This would give every child in the school their own personal copy of the book to keep at home. Last Chance to to get Tickets for our Fundraiser this Friday. Tickets now on Sale for our Fundraiser on 10/26! ReesSpecht the Water and END DROWNING NOW! The ReesSpecht Life Foundation, Inc.